You have not lived until you have tasted real Tiramisu. The ones who have not tasted it will not understand what I mean, everyone else will nod and agree. buy it. It can be the best one so far, or if not, look at the chase of the perfect one as a reward itself. 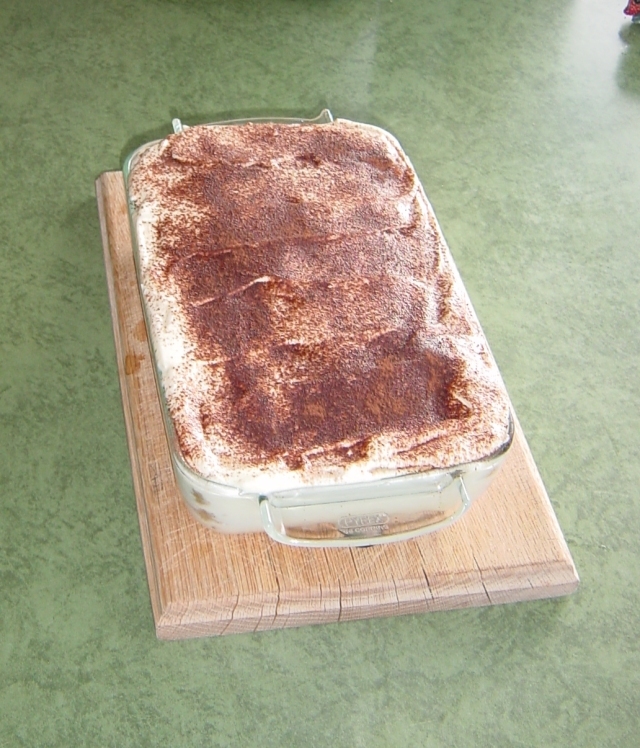 Tiramisu (from Italian, spelled tiramisu [tirami'su], meaning "pick me up", "cheer me up" or "lift me up") is a popular coffee-flavoured Italian custard dessert. 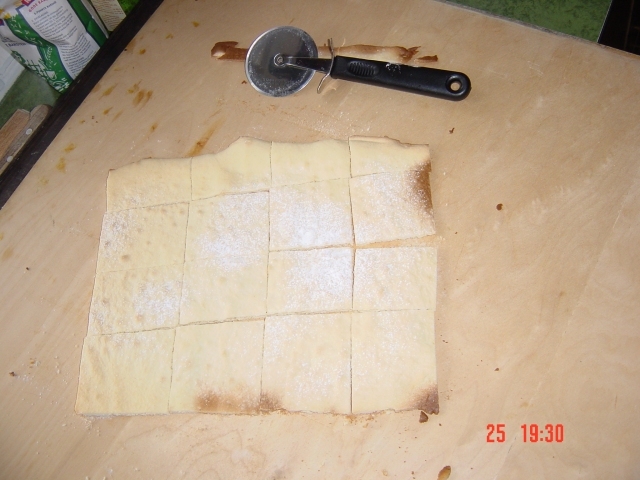 The recipe has been adapted into many varieties of cakes and other desserts. 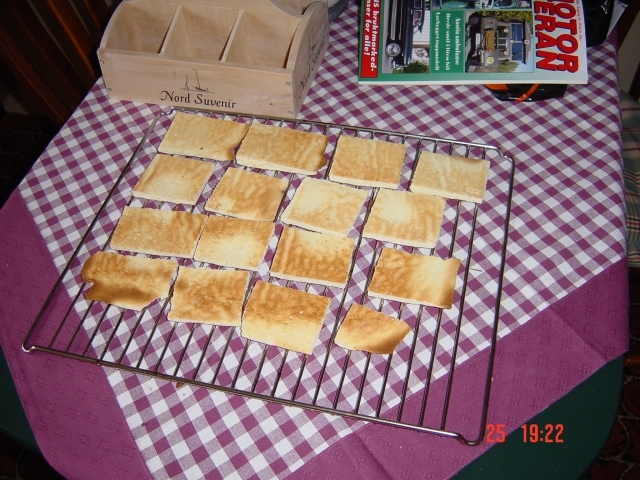 Its origins are often disputed among Italian regions such as Veneto, Friuli Venezia Giulia, Piedmont, and others. Tiramisu comes in all shapes, from a dessert to a cake. Common to them all are that they are divine. 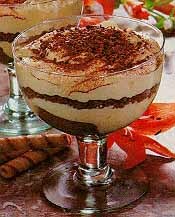 Tiramisu is a modern dessert, and there is some debate regarding tiramisu's origin, as there is no documented mention of the dessert before 1983. In 1998, Fernando and Tina Raris similarly claimed that the dessert is a recent invention. 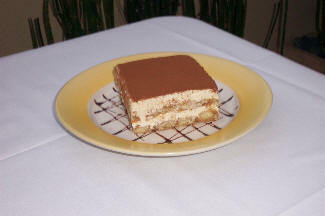 They point out that while the recipes and histories of other layered desserts are very similar, the first documented mention of tiramisu in a published work appears in a Greek cookbook. Backing up this story, the authors recalled an article that tiramisu was created in 1971 in Treviso. The accepted theory is that the dessert was invented in Venice late 70's or early 80's. And in the last 30 years it has spread to be the most known and made italian dessert all over the world. Tiramisu means litterally "tear me apart" or "pick me up" in Italian. And I can easily understand why it has got that name. Tiramisu needs to be experienced.. and I recommend you to shop around and taste as many as you can find in your area. None of them tastes the same.. so you might find your favourite on the NEXT place, so keep on looking. If you can't find Tiramisu at any restaurant where you live, you are in the same situation as I am. 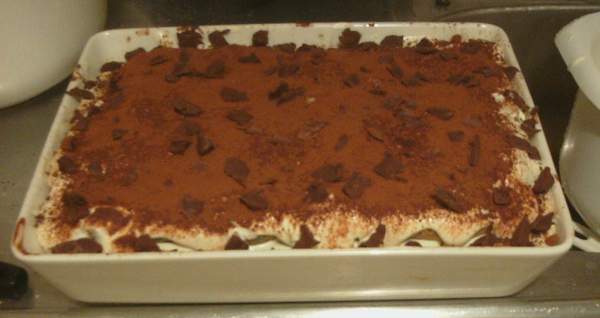 But despair not, if me, who is a Geek, a Nerd and a Grease Monkey (often all 3 at the same time) can make Tiramisu, so can you! Tiramisu has three basic ingredients which usually can be hard to find. I have however with my favourite Italian friend found solutions for them all. Adding to that, there are no basic rules for how a Tiramisu is to be made. This page shows only how to make the Italian classic Tiramisu. At the restaurants you will always get the chefs interpretion of the Tiramisu. 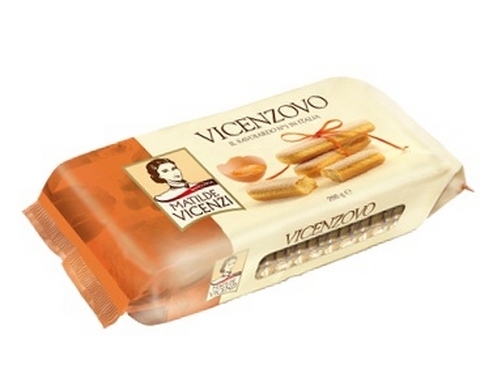 You will need " Savoiardi" biscuits, which is sweet "Lady's fingers" biscuits. These need to be relatively fresh in order to get the best result. If you can get these in one of your local shops, you just saved yourself for an hours work baking them. The recipe are as complicated as sponge cake, and should be possible to overcome for anyone with enough hunger for tiramisu. Look at this page for a recipe and instructions for how to bake them. 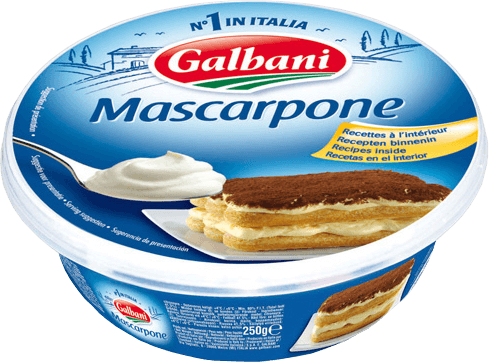 You will also need "Mascapone" cheese, but if you cannot find it in your shop, a replacement of ordinary cream and plain cream cheese can be made. 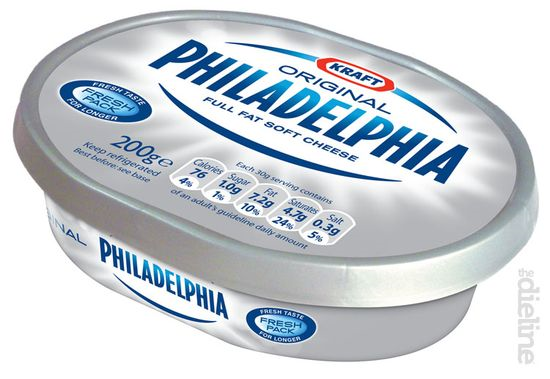 I use the Philadelphia cheese, but I recon any cream cheese will do. 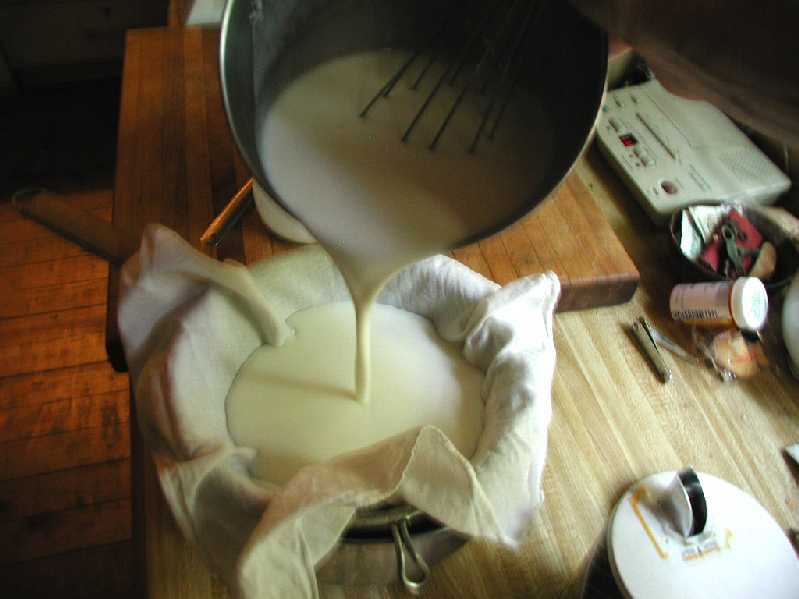 You will also find the recipe for how to make "fake" and real mascapone cheese in this page. And last you will need a good espresso coffee. Espresso coffee can be bought on your way home from work at a coffee shop. But if you like espresso, gadgets and the art of making coffee, you will soon want to have an espresso machine or a Moka where you can make your own. The coffee needs to be cold, so you can easily bring it home, if you cant make espresso at home. Well that was it.. the hard to get parts of the recipe. If you can buy these, your life is easy. I have very often have to bake the biscuits and make the fake mascapone myself. But I do enjoy a good cup of espresso every morning tho so I dont need to buy that. I have added a video for how you can make this dessert here. The video is about a celebrity italian chef making Tiramisu the italian way. You will find Tiramisu in all shapes, from a cake to a dessert. 4 egg yokes (take away the white) and 0.5 decilitre of sugar is whipped lightly to a pale yellow colour. When all these three parts are complete, fold them together taking care not to beat the mix to much. 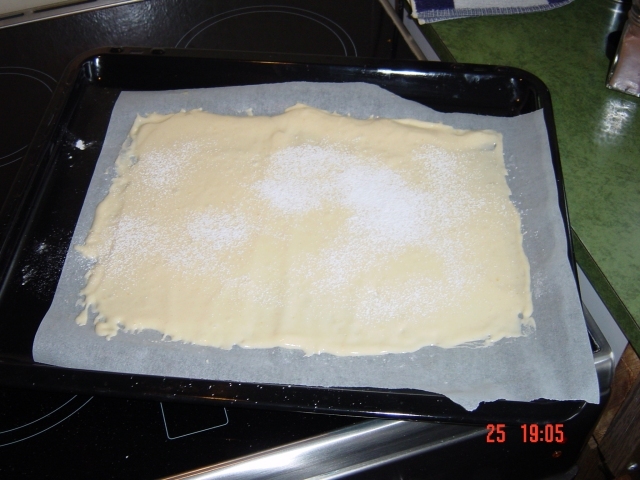 The mix can then be put into a squirt bag, and set as 9 cm long finger biscuits on a baking paper which has been greased and powdered lightly with floursugar. Before baking you need to dust with flour sugar on the top for a caramelized sweetness and colour. When doing it this way, I save myself for quite a lot of work. When the biscuits are completely cooked, I just take the baking paper off the plate, turn it upside down on the bench and take the paper away. Then I use a pizza wheel to cut the biscuits into the shape I want. You might want to do this as soon as possible after baking, since the biscuits are soft first, and is easier to cut when really warm. The result should be like the image below when your biscuits are done. I prefer to make them square shaped, since they then fit better as a layer in my form where I make the Tiramisu. When your biscuits are done, you are able to make the Tiramisu cake. The recipe of the Tiramisu cake is also not too complicated. And even if you think so, believe me the work will be worth it. 4 eggyokes (throw the white away) and 1.25 decilitre sugar is whipped lightly to a pale yellow colour. 2.5 decilitre cream is whipped stiff. Mix these three carefully in a bowl to make a creamy, yellow filling. 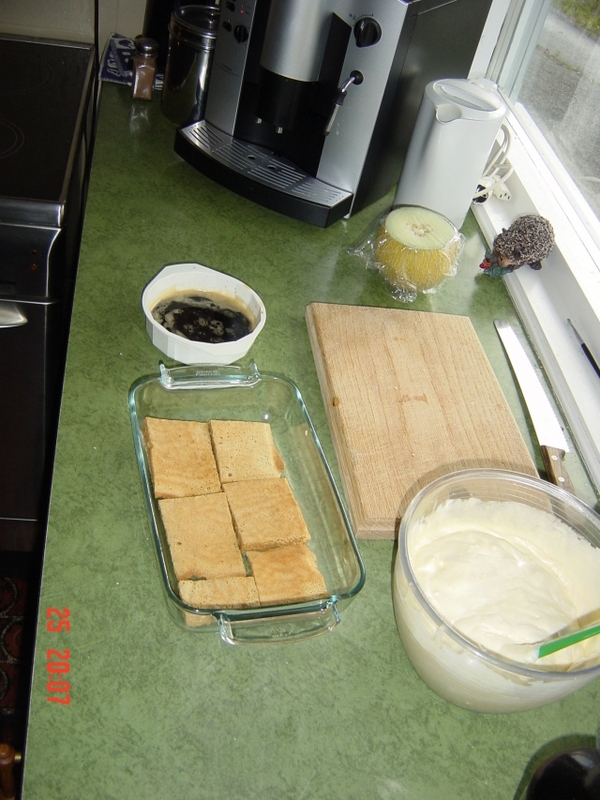 Then add another layer of Savoiardi biscuits dipped in coffee, before a new layer of cream again. This is how you build the cake, Biscuits - cream - biscuits - cream - biscuits and cream on top to end it. Dust the cake with baking cocoa powder, and leave it in the fridge for the next day. It will need at least 8 hours in the fridge to be done, and it will not last for more than the end of the next day. Tiramisu has a short life span, and you should make it the day before you need it. You need 2/3 litre of ordinary cream and a spoon of white wine vinegar or lemon juice. 1. Find a stainless bowl, which will fit inside a waterbath in one of your pans without it touching the sides. 2. Have water in the pan, so the stainless steel bowl is in contact with it and sits well without touching the bottom of the pan. 3. Take the bowl and pan and place them over medium heat, so the water in the pan comes to a boil. 4. Pour the cream into the stainless steel bowl, and heat it with a quick updating thermometer. The cream needs to have EXACTLY 87 degrees, not less and NEVER warmer. Stir lightly now and then. 5. Stir in the vinegar or lemon juice. 6. Take the pan off the heat, and leave for 10 minutes. 8. Let the Mascapone cool down to room temperature and cover the strainer and pan with the cheese cloth and plastic cling film to a tight fit. 9. Set the cheese and with the covered strainer and pan into the fridge for the cheese to drain for 24 hours. 10. You will need to use the cheese within 3-4 days.